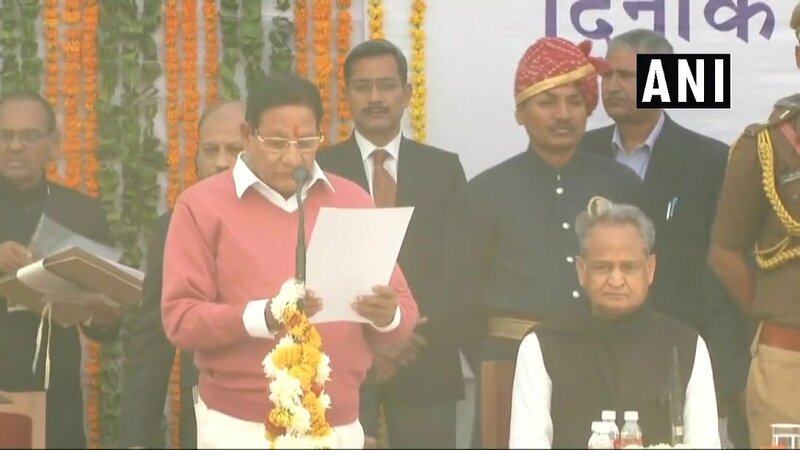 A total of twenty-three ministers took oath as Ministers in newly-formed government in Rajasthan lead by Chief Minister Ashok Gehlot and Deputy CM Sachin Pilot today. 13 cabinet ministers and 10 state ministers took oath in Rajasthan cabinet today. The 13 cabinet ministers who took the oath included Shanti Kumar Dhariwaal, Master Bhanwarlal Meghwaal, BD Kalla, Prasadilal Meena, Raghu Sharma, Pramod Jani Bhaya, Rameshchand Meena, Lal Chand Katariya, Harish Choudhry, Vishvendra Singh, Udaylal Aanjana, Pratap Singh Khaachriyawas and Saleh Mohommad. The 10 state ministers are Mamata Bhupesh, Govind Singh Dotasra, Bhanwar Singh Bhati, Ashok Chandna, Arjun Bamaniya, Bhajanlal Jatav, Tikaram Juli, Sukhram Vishnoi, Rajendra Singh Yadav and Subhash Garg. Congress had won assembly elections on Dec 11 garnering 99 seats and formed the government with other allies. Gehlot and Sachin took the oath of office on Dec 17 in a ceremony attended by opposition parties led by Congress President Rahul Gandhi.